Wrist injuries are common. If a wrist injury causes significant damage to the ligaments, it can result in serious problems in the wrist. Such an injury typically continues to cause problems unless corrected. 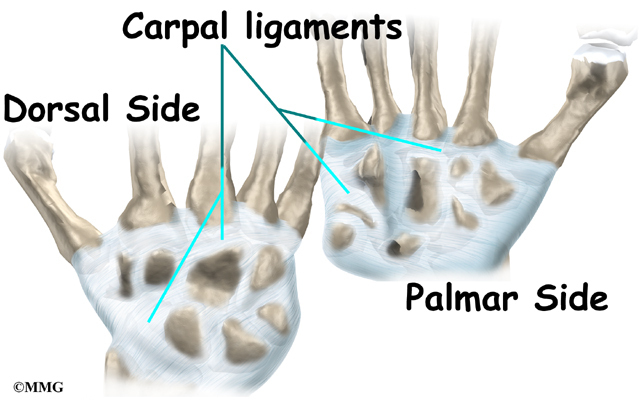 The front, or palm-side, of the wrist is referred to as the palmar side. The back of the wrist is called the dorsal side. The wrist is made up of eight separate small bones, called the carpal bones. The carpal bones connect the two bones of the forearm, the radiusand the ulna, to the bones of the hand.The metacarpal bones are the long bones that lie underneath the palm. The metacarpals attach to thephalanges, the bones in the fingers and thumb. 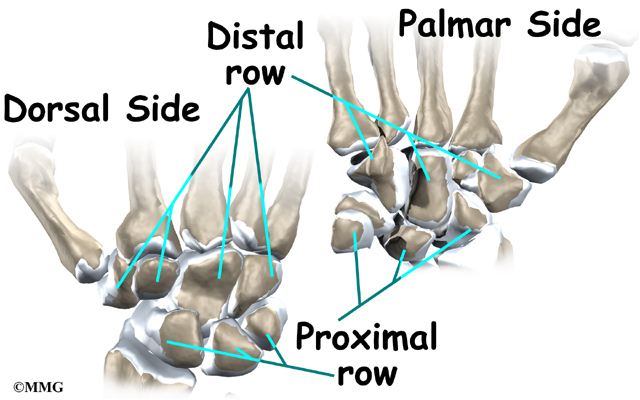 The carpal bones are arranged in two rows: the proximal row of four bones sits next to the forearm (radius and ulna), and the distal row of four bones connects to the metacarpal bones. These two rows of bones work together like the links in a chain to allow the hand to move up (dorsiflex) and down (palmarflex). The connections between each carpal bone also allow the bones to shift as the hand is moved sideways (radial deviation and ulnar deviation). One reason that the wrist is so complicated is because every small bone forms a joint with the bone next to it. Articular cartilage covers the ends of bones where they meet in a joint. Articular cartilage is a smooth, slippery substance that lets the bones slide against one another without causing damage to either surface. Ligaments connect all the small wrist bones to each other. 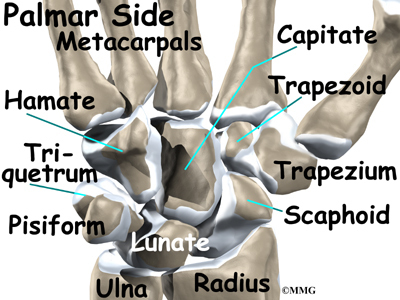 Ligaments also connect the bones of the wrist with the radius, ulna, and metacarpal bones. These ligaments are important in balancing the movement of all of the wrist bones. When one or more of these ligaments is injured, the way the bones move together as a unit is changed. This can lead to problems in the wrist joint that cause pain. Eventually, arthritis may develop in the wrist joint. How do ligament injuries of the wrist occur? 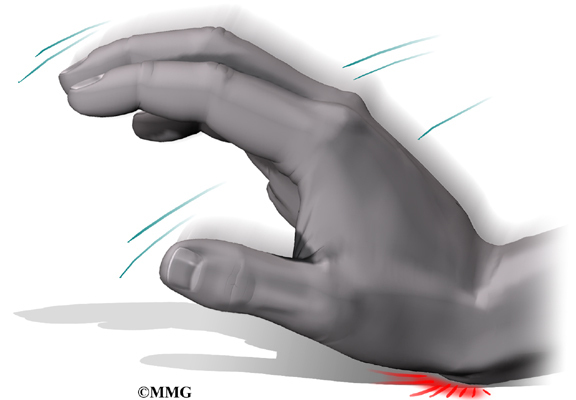 By far the most common way the wrist is injured is a fall on an outstretched hand. (The same type of force can happen in other ways, such as when you brace your self on the dashboard before an automobile crash.) Whether the wrist is broken or ligaments are injured usually depends on many things, such as how strong your bones are, how the wrist is positioned during the injury, and how much force is involved. Any kind of injury to the wrist joint can alter how the joint works. After a wrist injury, ligament damage may result in an unstable joint. Any time an injury changes the way the joint moves, even if the change is very subtle, the forces on the articular cartilage increase. It’s just like a machine; if the mechanism is out of balance, it wears out faster. Over many years, this imbalance in joint mechanics can damage the articular cartilage. Since articular cartilage cannot heal itself very well, the damage adds up. Finally, the joint can no longer compensate for the damage, and the wrist begins to hurt. How do I know if I have a ligament injury of the wrist? When an injury occurs, pain and swelling are the main symptoms. The wrist may become discolored and bruised. Doctors refer to this as ecchymosis. The wrist may remain painful for several weeks. There are no specific symptoms that allow your doctor to determine whether a wrist ligament injury has occurred. Once the initial pain of the injury has subsided, the wrist may remain painful due to the instability of the ligaments. If the ligaments have been damaged and have not healed properly, the bones do not slide against one another correctly as the wrist is moved. This can result in pain and a clicking or snapping sensation as the wrist is used for gripping activities. In the late stages, the abnormal motion may cause osteoarthritis of the wrist. This condition can cause pain with activity. During activity, the pain usually lessens, but when the activity stops, the pain and stiffness often increase. As the condition worsens, a person may feel pain even when resting. The ability to grip with the hand may be diminished. The pain may interfere with sleep. The diagnosis of ligament injuries of the wrist begins with a medical history. Your doctor will want to know about any injuries to the wrist, even if they were years ago and healed without much problem. Your doctor will then physically examine your wrist joint. It may hurt when your doctor moves or probes your sore wrist. But it is important that your doctor sees how your wrist moves, how it is aligned, and exactly where it hurts. You will need X-rays. X-rays are usually the best way to see what is happening with your bones. After a wrist injury, X-rays can help determine whether a wrist fracture has occurred. X-rays can also help your doctor determine whether certain types of ligament injuries have occurred by looking at how the bones of the wrist line up. If X-rays do not show enough information, other tests may be ordered to view the ligaments better. In some cases, an arthrogram of the wrist is used. This test requires that dye be injected into one of the small joints of the wrist. Special X-rays are then taken to look for leakage of the dye out of the joint. This may help confirm that the ligaments are torn. More recently, doctors are also using magnetic resonance imaging (MRI) to look at the wrist ligaments. The MRI machine uses magnetic waves to create pictures that look like slices of the wrist joint. Unlike X-rays, an MRI scan shows the soft tissues such as ligaments quite well and can sometimes confirm the presence of a torn ligament in the wrist. Finally, for cases in which the diagnosis is still in question, arthroscopy of the wrist joint may be used to determine whether a ligament injury is causing the continued symptoms. The arthroscope is a miniature TV camera that is inserted into the wrist joint to allow the surgeon to see the ligaments that may be torn. In some cases, the arthroscope may also be used to assist with repair of the ligaments at the same time. What can be done for ligament injuries of the wrist? The first challenge in treating a ligament injury of the wrist is recognizing that it exists. Many patients fall and injure their wrist and assume they have a sprain. They treat the sprain with rest for a few weeks, and then resume their activities. Many ligament injuries go unrecognized until much later when they cause problems. The treatment of a ligament injury depends on whether it is an acute injury (just happened within weeks) or a chronic injury (something that happened months ago). A wrist injury that causes a partial injury to a ligament, a true wrist sprain, may simply be treated with a cast or splint for three to six weeks to allow the ligament to heal. In cases where the ligaments are completely torn and the joints are no longer lined up, surgery may be suggested to either repair the ligaments or pin the bones together in the proper alignment to hold them in place while the ligaments heal. There is no single operation that is used to fix ligament injuries of the wrist. Several surgical procedures are used depending on the problem. If the ligament damage is recognized within a few weeks after the injury, the surgeon may be able to insert metal pins to hold the bones in place while the ligaments heal. This procedure is called a percutaneous pinning. (Percutaneous means through the skin; an incision is not required.) The surgeon uses a fluoroscope to watch as the pins are placed. The fluoroscope is a type of continuous X-ray machine that shows the X-ray image on a TV screen. In some cases, getting the bones lined up properly is not possible, and an incision must be made to repair the ligaments. The longer the surgery is done after the initial injury, the less likely it is that the bones can be aligned properly. It is also less likely that torn ligaments will heal once scar tissue has developed over the ends. The metal pins are placed to hold the bones still while the ligaments heal. The pins are usually removed four to six weeks after the procedure. When the ligament damage is discovered six months or more after the initial injury, the ligament may need to be reconstructed. This procedure involves making an incision over the wrist joint and locating the torn ligament. Once this is done, a tendon graft is used to replace the ligaments that have been torn. 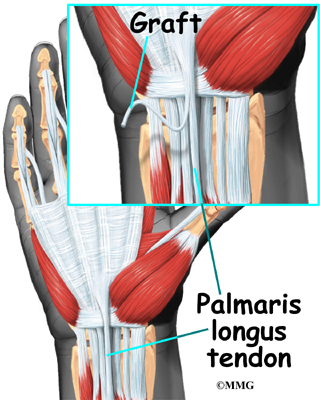 The tendon graft is usually borrowed from the palmaris longus tendon of the same wrist. This tendon doesn’t do much and is commonly used as a tendon graft for surgical procedures around the hand and wrist. The tendon is removed from the underside of the wrist through one or two small incisions. 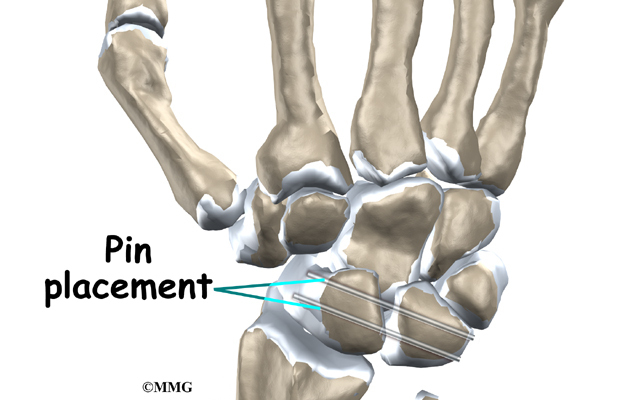 Again, metal pins are used to hold the bones stationary while the tendon graft heals. The pins are removed six to eight weeks after the surgery. When the ligament instability is discovered long after the injury and arthritis is present in the joints between the unstable bones, a fusion may be suggested. Two or more bones are fused by removing the cartilage surface between the bones. When the raw bone surfaces are placed together, the bone treats them as it would a fracture. The surfaces heal together. The bones fuse into one bone. This stabilizes the motion between the bones and reduces the pain that occurs when the arthritic joint surfaces rub together. If the entire wrist has become arthritic from longstanding instability, a complete wrist fusion may be required. After wearing a splint or cast for three to six weeks, your doctor may have you work with a physical or occupational therapist. Treatments are used to help you regain wrist range of motion, strength, and function. If you have surgery, your hand and wrist will be bandaged with a well-padded dressing and a splint for support. Physical or occupational therapy sessions may be needed for up to three months after surgery. The first few treatment sessions focus on controlling the pain and swelling after surgery. Patients then begin to do exercises that help strengthen and stabilize the muscles around the wrist joint. 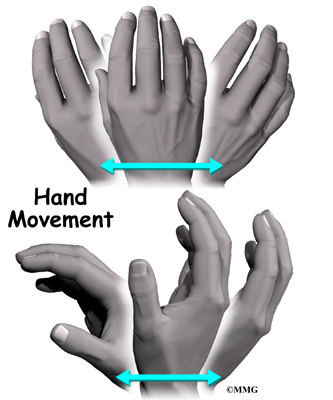 Other exercises are also used to improve the fine motor control and dexterity of the hand. The therapist suggests ways to do activities without straining the wrist joint.